Before World War II, war reporting was considered NO JOB FOR A WOMAN. But when American female reporters fought and won access to cover the war, there was another battle to fight: Women would be banned from the frontlines, prevented from covering Front Page stories, and assigned “woman’s angle” stories. Instead, they turned their second-class assignment into a new kind of war story: one that was more intimate yet more revealing. “No Job For a Woman”: The Women Who Fought to Report WWII tells this story through the lives and work of wire service reporter Ruth Cowan, magazine reporter Martha Gellhorn, and war photographer Dickey Chapelle. “No Job For a Woman” broadcast on PBS World Channel throughout Women’s History Month — March 2013, 2014, 2015. 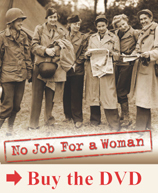 The DVD of No Job for a Woman is available for purchase from Women Make Movies - click below to buy!